Lock in a great price for Youth Hostel Echternach – rated 9 by recent guests! Great facilities and super clean. Really lovely, huge place and they have wifi in rooms. All the workers there were really nice to me. Actually ended up having the whole dorm room to myself. Nothing I would change about the facilities. Right by the lake. The building facilities were incredible. Some of the best I’ve experienced at any hostel. It’s location is right by a lake and a quick walk into the village. I would highly recommend this spot to anyone who likes hiking as it is close to the Mullerthal trail. Great furnished room in this hostel and kept quite clean. Good restaurant called hot pot with reasonable price and nice taste. Warmly welcome service provided by the staff. Beautiful location; reception staff and the chefs were amazingly friendly and beyond helpful. The facilities in the room were impeccable and the food, freshly prepared, delicious, beautifully presented, enormous portions and the price was incredible value for money. Cannot wait to return. What stands above all in this accomodation is its quiet and nice location near a lake. It is just 20 minutes walking away from the central bus station and the Echternach city centre, and there's no problem about coming back at night as it is well illuminated. Very modern facilities and shared rooms, each one with its own updated toilet and bathroom. Really no possible complaint about it. All well prepared for a trek to the surrounding Müllerthal trails, whose beauty surprised me. I would definitely recommend it. Great peaceful location at the lake of Echternach. Clean and basic rooms with private shower and toilet. An excellent starting place for hiking in the surrounding wonderful beech forests. Staff is very friendly and room was clean. I stayed in females sharing room. Wish they give towels too. The only disappointment I had is that on the next morning I found on myself few bed bugs’ bites. I went for a walk around in evening with the girl I met in the room and we seen a man jerking off nearby the hostel, so I’m not sure how safe is the area. Very nice, clean and a new hostel in Echternach. 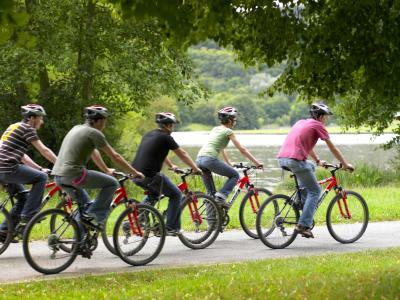 It's located near the lake surrounded by greenery, around 2 km from the city centre. Great starting/ending point for the routes of Mullerthal trail passing Echternach. In the hostel there is a climbing wall, sports hall and an outdoor volleyball pitch, so it's a very good place for active people. 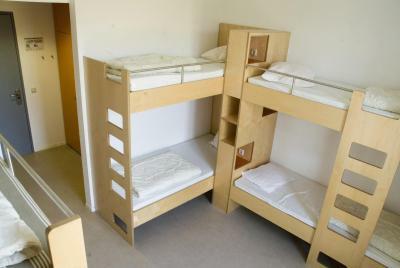 The room itself is quite spacious fitting three comfy bunk beds equipped with small drawers, electric socket and a night light. In the room there is a private toilet, shower and a sink, and what's more, there are additional facilities in the hallway. 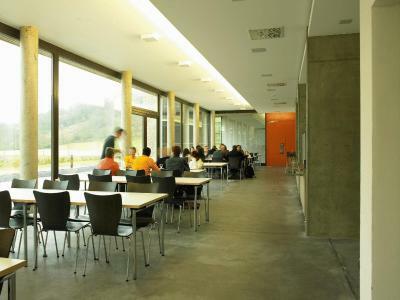 On the ground floor of the building there is a cafeteria with the outdoor terrace serving some food and drinks till night hours. Breakfast is typically continental - ham, salami, cheese, jam, Nutella, cornflakes, yoghurt, coffee, tea and juice. Next to the hostel there is a big free parking space which might be a bit crowded on the weekends. I warmly recommend. 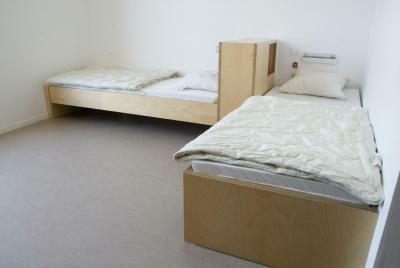 staff friendly and accomodating, confort of the room, the price very good for luxembourg, the environement, the confort. Breakfast and dinner are very tasty! The location is beautiful! 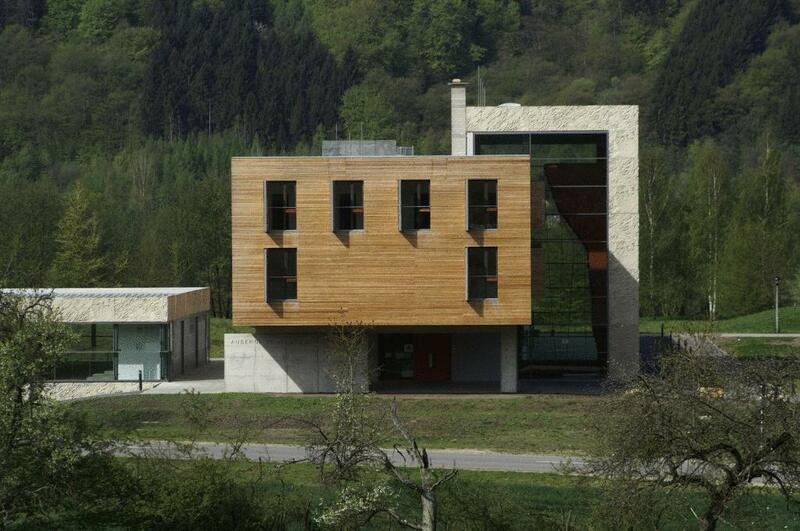 This hostel is set in a futuristic building neighboring Lake Echternach. 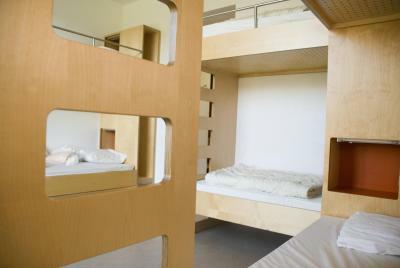 It features shared dormitories with free Wi-Fi and a fully equipped sports center including a 46 feet high climbing wall. The dormitories at Youth Hostel Echternach each have their own bathroom facilities. They have bunk beds and guests can store their luggage in the cabinets. Facilities for disabled guests are also available. Breakfast is available in the morning. At the end of a busy day, they can relax and have a drink or snack in the hostel’s cafetaria. Eternach center city is less 1.2 mi away from the hostel. 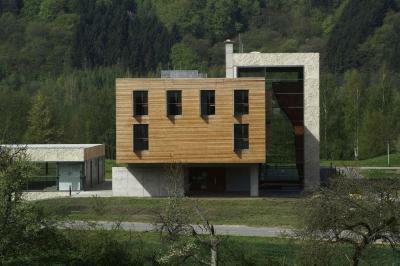 The Deutsch-Luxemburgischer Naturpark is 5 mi away. This property is also rated for the best value in Echternach! Guests are getting more for their money when compared to other properties in this city. When would you like to stay at Youth Hostel Echternach? House Rules Youth Hostel Echternach takes special requests – add in the next step! Youth Hostel Echternach accepts these cards and reserves the right to temporarily hold an amount prior to arrival. Please note that charges for access to the sports center are applicable. Amazing location, very clean, and rooms have private bathroom. Not a good place to meet other people and hang out (youth hostel NOT a backpacking hostel). I stayed at a different youth hostel before and the breakfast and food was a lot better. The food lacked having any veggies or fruit. Wish they give towels too. The only disappointment I had is that on the next morning I found on myself few bed bugs’ bites. I went for a walk around in evening with the girl I met in the room and we seen a man jerking off nearby the hostel, so I’m not sure how safe is the area. The wifi sometimes worked and sometimes was very slow. There was no kitchen which is not ideal for a hostel! The area with table and chairs closes at 8 which was annoying. No mixed dorms, even if they were listed on the website. WiFi was only in the registration hall, not in a room. There were no soap or shampoo, no towels at all (you have to have your own). Beter wifi signaal in rooms. No security lockers for your stuff in rooms! The remote location from the city center. If you don’t have the vehicle, that would be troublesome.